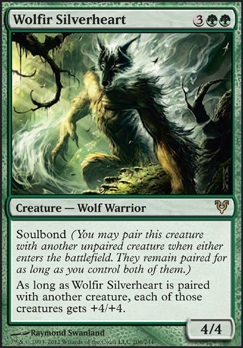 Soulbond As long as Wolfir Silverheart is paired with another creature, each of those creatures gets +4/+4. I don't really like stifle-like cards, as they merely delay inevitable. Perhaps I can cut Incubation/Incogruity in favor of Chaos Warp , since pure anti-creature factor is not that important unless it's Avacyn, Angel of Hope I am dealing with. Yes, those are good options to be removed. Perhaps, even Wayfarer's Bauble could be a better option than Cultivator's Caravan , since lands are harder to remove. However, I am not sure about Wolfir Silverheart - he is practically 8/8, and +4/+4 is a huge buff to anything - like Impervious Greatwurm which I am considering right now. 20/20 idestructible, with Surrak flashing for surprise, can be huge. It was demoralising for my opponents in every game of playtest to lose 15+ life in a single swoop (turning it into archenemy very fast). Funny thing Luarviq, Deadeye/Peregrine( Palinchron ) combo not as bad as you would think. There are many ways to actually deal with it. Provided you have the mana on the time as well. Like in response to ETB trigger you can remove Deadeye, or response to activating soulbond. In regards to Defense of the Heart , there should really be no reason why that stays on the battlefield longer than one rotation with it being active. There are several great removals that are cheap and decent, ex. Nature's Claim , Krosan Grip , Naturalize , Deglamer , Unravel the Aether to name a few. I am a fan of tutors, because they lead to deck consistency, it does goes against the spirit of EDH but I am a competitive player so I like to win. greatdevourer on What is Best in Life? Consider dropping the following: Derevi, Empyrial Tactician - not a Warrior Boros Signet, Selesnya Signet & Gruul Signet - weak color fixing and better use of sleeves. Bident of Thassa - not sure, seems kinda weak but it may be better in your deck. 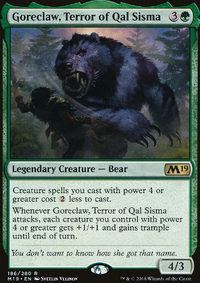 Bear Umbra - cute aura, but aura's are weak in multipler unless your playing aura voltron. Sosuke, Son of Seshiro - you aren't making snakes. I know that the destroy a creature is nice, but deathtouch does effectively the same thing. Bloodsoaked Champion & Reassembling Skeleton - skullclamp or chump block all day long. Surrak Dragonclaw & Yasova Dragonclaw - Because why not? Imperious Perfect & Nacatl War-Pride - tokens! There are more Warriors to consider, but I wanted to focus on some utility that you may have overlooked. Ok. Budget deckbuilding theory time. 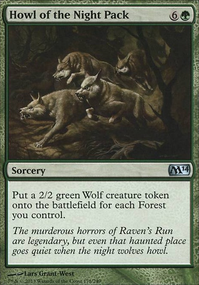 'Non human werewolves' is a nice start- Paying a bunch of mana to flip a wolf is a neat little bit of card advantage to build around. To get that to happen, you need to build a midrange deck, and look to keep those wolves alive, because it isn't fast enough to race straight up. Regardless of what you pick, you're going to have to pick some cards that take you to the midgame where you can draw ahead. Personally, I'd make it a G/B werewolf deck and jam 12 Duress variants and a couple draw engines, but thats how I fix most my deckbuilding problems. It doesn't matter how much you screwed up your creature choice if its the only thing on the field and your opponent doesn't have an answer. Mono green is an option, running fringe cards like Beast Within, lifegain like Jaddi Offshoot and ramp like Search for Tomorrow, although it is possible to fall behind a long way on board, and without copies of whatever Damnation variant you like it can be tricky. Blue green Fable of Wolf and Owl is an option, with Mana Leak and Prophet of Kruphix alongside wolves with flash and Mystic Snake, looking to draw out the game and win on card advantage, with a backing of creature ramp/instant speed card advantage. Think Twice and friends basically. Uncaged Fury can be cut. Its worse than other double strike options and doesn't play to that midrange strat. If you want the cheap power then just jam some Rancor. More ramp tools or cards which make an immediate gamestate impact need to be played for 4 mana. 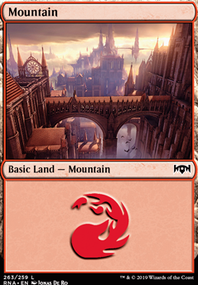 Your manabase needs tidying up- there are plenty of examples of good manabases in decks across the site- including examples of ramp strategies, budget duel colour strategies and appropriate utility lands. Keep an eye on your gameplan, and have a critical window- know what turns your deck wants to be strong and where you can afford to be weak. Last but not least, sideboard. If your meta is KCI and affinity, jamming artifact destruction will save you games. There are plenty of examples on site. I like the idea of Sin Prodder, but I would replace them with Zhur-Taa Druid. Reason being that they could really screw you over if you are in a pinch. The druid however would produce mana, and some damage. This would result in having a total of 12 creatures being mana-prodducers, There are two obvious solutions; first, work with the mana, and toss in some hydras, second, replace some of the mana-producers with other cheap spells, such as Dragon Fodder for a handful of early game blockers. I would also replace Pathbreaker Ibex with Wolfir Silverheart, or hydras if you are running with the mana. Endless One is a cheap alternative to hydras, but if you have them, or the money, I would recommend Primordial Hydra. All of that being said however, I love the use of Shaman of the Great Hunt! Hey there, I really like Rapacious One in my Xenagos deck, curves out of Xenagos, and sets you up to cast the real big stuff/multiple threats ( Worldspine, Giant Adephage, Balefire Dragon) after the table realises your going to kill them all. I found that as my playgroup got used to getting hit for 30+ damage they began to lean heavily on wraths to try and stem the flow, so I began to shift to annoying, value beaters and recursion. Genesis regrows a creature at the low cost of 3 mana every turn, Vorapede is a fine beatstick without Xenagos, Feldon of the Third Path is an excellent way to get value out of your graveyard, too. Deadwood Treefolk was also surprisingly good, though it’s maybe outclassed by Greenwarden of Murasa, it still mashes in for 6 w/‘Gos out and blocks well. Eternal Witness is another option. And Atarka, World Render, the “you take 24” cannon that gets better if you throw even a few extra dragons in ( Scourge of the Throne, Balefire, Dragon Broodmother produces a steady stream of chumps so you can swing freely each turn. 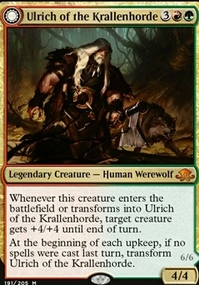 And Wolfir Silverheart for the casual 12/12 worth of power for 5 mana. Temur Battle Rage is an ace here too.